Level 6 of the Code for Sustainable Homes will come into effect in 2016. The zero carbon standard, like it or not, is just around the corner. With energy set to become the new big-ticket item, housebuilders will have to cut their cloth accordingly. The Netherlands, not a country noted for standing still when it comes to construction - having half your country one meter below sea level is no doubt an added incentive - have come up with what, at first glance, appears to be a far fetched idea. Printing houses. And they, it seems, are not the only ones. The University of California (where else) are also experimenting with robotic 3D printing machines. The largest of these machines, six meters in height, is capable of printing a single room in one go. The benefits of 3D printed houses? Zero waste, reduced transportation costs and a palette of recycled building materials including everything from recycled chipboard to plastic. The benefits aren’t limited to construction. One of the big plus points of 3D printing is that once a building has reached the end of its life-cycle it can simply be melted down and the materials used again. 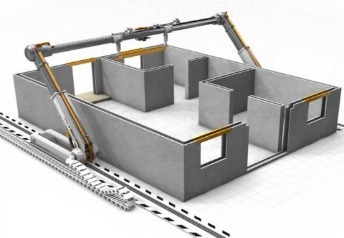 How far off are we to producing the first 3D printed house? A 3D printed canal house in Amsterdam, comprising of 13 rooms, is scheduled to be completed in 2016. The same year that the level 6 code for sustainable homes will come into effect.